Austin has been named one of the fastest gentrifying cities in Texas. With the influence of the University of Texas at Austin, the construction projects keep piling up all over downtown and West Campus. The Ramirez family, my mother’s side of the family, has lived in East Austin for decades, but the new neighbors are slowly taking away the family’s first beginnings. The Cortez household overlooks the neighboring houses and buildings that have since changed in familiarity for East Austin residents such as Jesse Cortez and his family. Jesse and his wife Diana Cortez hold a pot, that is used to make tamales outside in a small pit in the ground. They have been carrying on this tradition for years. For a short time, my mother used to live in a smaller house that was adjacent to the main house before moving to San Antonio with her family. There, her grandmother would feed them homemade tortillas, bathe them in the yard and look after all of the children while her parents were at work. During the holidays, they would cook tamales the old-fashioned way by killing a pig for meat, digging a pit and cooking the meat underground for hours. My mom’s humble beginnings are stories I hold close to my heart because they are so raw and insightful. My cousin Jesse still upholds parts of this family tradition every year. Diana’s mom sits outside on the porch. Many family members of the Cortez family can be found on Haskell Street. A concern among the family, especially for Diana, is not having the easy access to care for her family members. Cortez says that realtors occasionally park outside his home and wait for him to come out so they can offer to buy his land. One realtor approached Cortez, saying, “Your trees are placed in the perfect spots for rebuilding.” Cortez says he felt that the comments came across as disrespectful. He and other neighbors identify the Keller Williams group as the main investors who pester them to sell. Sitting across the table from my cousin, hearing him recite our family origin story gives me chills, but the feeling of diaspora begins to creep up as I face the reality that the Ramirez home may not be here by the time I have children. Here is where I heard stories about my ancestors from Mexico and where I discovered my Native American roots. Here is a place that gave me part of my identity that I wear proudly on my sleeve. Although the stories are strong to my roots, they are not strong enough to hold back from the hands of gentrification. Beyond my own feelings, I realized that this neighborhood is the type of area that makes Austin what it is and for the sake of the city’s culture, it should not be erased. 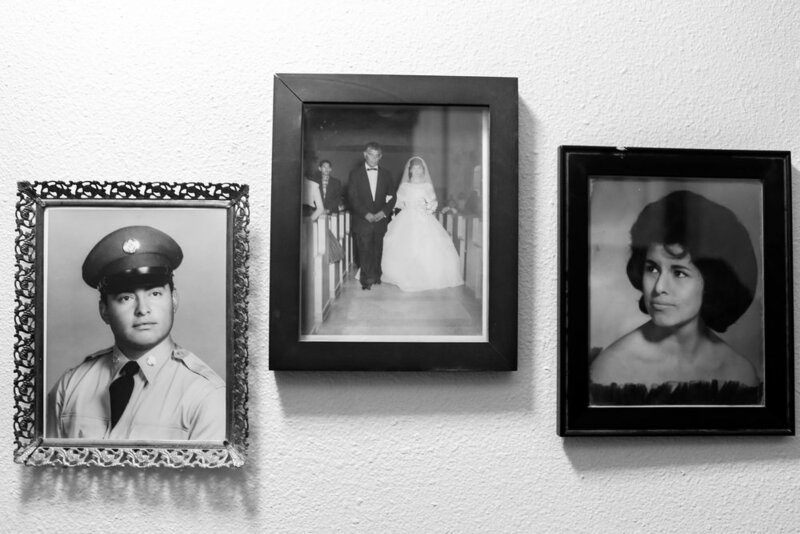 Near Don Antonia’s altar displays hangs photos of first-generation aunts and uncles of the family. Not only does this neighborhood hold memories, but it is a historically significant neighborhood for the Mexican American labor movement connnected to prominent names like Cesar Chavez and Sen. Gonzalo Barrientos. Sen. Barrientos was from East Austin and supported movements aimed towards improving the quality of life for underrepresented communities like the one that my family is from. My tia (aunt) Ramona, Ramona Vasquez, daughter of Antonia and Dolores Ramirez, lives next door to Cortez. In her home is a plaque of recognition given to her late brother, Frank “Poncho” Ramirez, from Senator Barrientos. “Poncho marched alongside Cesar Chavez at La Raza Unida Economy Furniture labor march in the ‘70s, and Senator Barrientos presented this plaque to him to honor his contributions,” Ramona says. The Economy Furniture Company Strike was a turning point for underpaid Mexican American workers in Austin during this time. Economy Furniture was the largest furniture store in the tri-state area including Texas, Arizona and New Mexico, and they refused to pay their workers, 90 percent of whom were Mexican American, above $1.75. A photo of Ramona’s brother marching alongside Cesar Chavez can be found in the Bob Bullock Museum near UT. On the wall hangs photos of the original house, Jesse’s wedding with Diana and a plaque given to Frank “Poncho” Ramirez, Jesse’s Uncle, by Sen. Gonzalo Barrientos for participating in the Economy Furniture Company Strike. The protest demanded for higher wages for Mexican workers. Ramona says realtors call her non-stop wanting to buy her duplex. “They bother me as if money is everything to me, and at this point of my life it simply is not,” Ramona says. “I value my family and the many generations that have come through and passed away before any amount of money,” Ramona says. Tia Ramona is of an age where her property taxes are set, but she still is forced to work a part-time job just to afford her property taxes. “I don’t want to keep dipping into my savings to live in my house, but these investors are not going to break me,” Ramona says. Elderly people in the neighborhood are being forced back into work solely to afford the property taxes on homes that they and their families have lived in their entire lives. It is astounding that my own family members shaped the culture of the city I live in now, and it is even more astounding to me that families like mine are not being protected from gentrification. If this neighborhood has brought up historical figures who have moved the city of Austin forward, and has raised senators who served the city of Austin and state of Texas, then why is the backbone of Austin being severely underrepresented? The simple answer to this is money. The rate of people who move to Austin is slowly outnumbering the native Austinites who have lived here before it was even named Austin. These people deserve representation if Austin wants to keep its culture. “Keep Austin Weird” is a common phrase that represents Austin’s culture, but it should be translated into “Keep the Real Austin Alive” if the Austin community wants to preserve its culture. 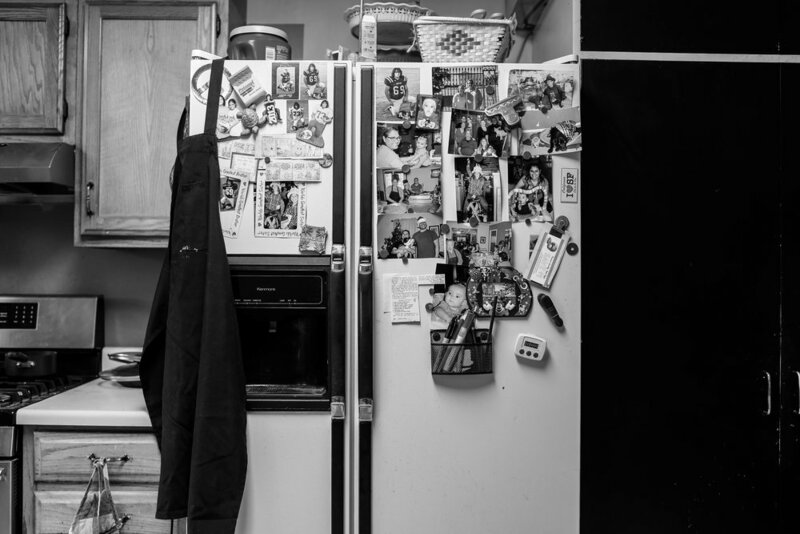 Pictures cover the refrigerator in the kitchen. The Cortez family refer to this as the wall of fame, their version of the walk of fame. Most members of the family can be found on here.